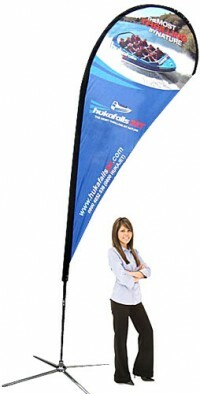 Portable flag stands are a special type of outdoor banner stand that hold single or double sided vertical banners. The single sided versions show through to the back side for a double sided appearance, but images and text will be reversed on the back side. All of these outdoor displays allow the flag to rotate around the support pole in the wind, which helps reduce the wind resistance and adds to the stability of the stand. 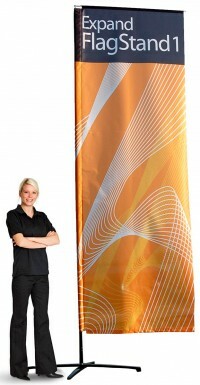 This category includes the popular teardrop and feather banners as well as several tall rectangular flag stands with either fixed height or telescopic flag poles that offer adjustable display heights of up to 18 feet tall. Each stand comes with a base to provide stability in the wind. Some models come with a hollow base allowing the option of adding either water or sand as a weighting agent, while others have weight plates, water weights, or ground spikes. These outdoor flag stands can also be used indoors, and are popular because most of these models are very tall, which allows them to be seen from a distance over top of other displays. 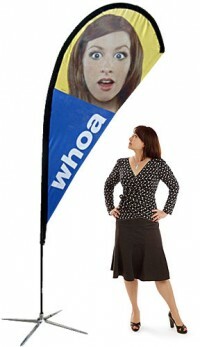 But, it's outdoors where they are at their best for branding and advertising at outdoor trade shows and other events. These displays are extremely effective for attracting customers to your booth or venue and they are a great addition to other outdoor displays or can be used on their own. For help in selecting a display, or if you don't see a product listed that fits your needs, please contact us for assistance.